The Centers for Medicare & Medicaid Services (CMS) just released the first batch of 2015 enrollment data for Medicare Part D Prescription Drug Plans (PDPs). These almost-final numbers provide our first look at the winning and losing plans. Our exclusive analysis shows that preferred cost-sharing networks now dominate the landscape. In 2015, 81% of seniors enrolled in PDPs with preferred cost sharing pharmacy networks. Humana’s three preferred network plans grew by 19% and now enroll one in five Part D beneficiaries. Instead of standing in a glass case of emotion, read on for our look at the biggest companies and PDPs. 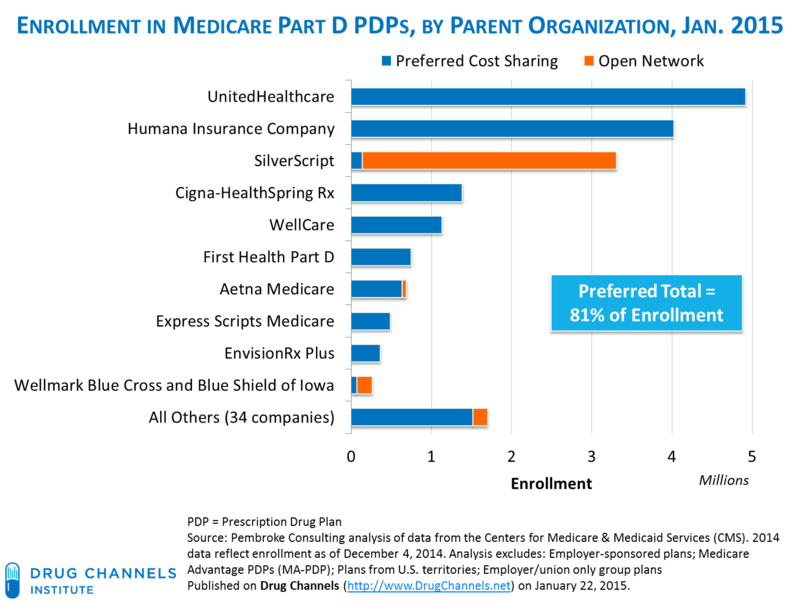 Data on PDP enrollment are available from this CMS page: Medicare Advantage/Part D Contract and Enrollment Data. Note that these data reflect enrollments accepted through December 4, 2014. The final 2015 numbers will differ, because the open enrollment period ended three days later, on December 7, 2014. The final sample included 91 Part D plans, operating 1,001 regional PDPs. The new enrollment data allows us to see how these plans performed. In 2015, 66 plans have preferred networks. These plans operate 870 regional PDPs, which account for 87% of the total regional PDPs for 2015. Based on the initial enrollment figures, these 66 plans enrolled 15.4 million people, or 81% of the PDP total through December 4, 2014. The top three parent organizations—UnitedHealthcare, Humana, and CVS Health's SilverScript—account for almost two-thirds of enrollment in stand-alone Part D plans. The top 10 companies (shown below) are 91% of enrollment. 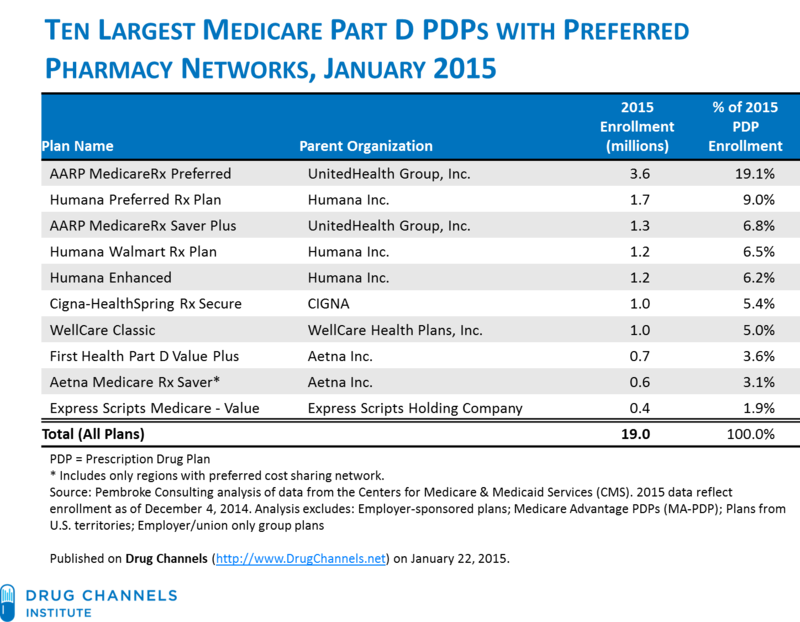 The second chart (below) contains our exclusive summary of the 10 largest Medicare Part D PDPs with preferred pharmacy networks. These 10 plans account for 67% of total Part D enrollment. 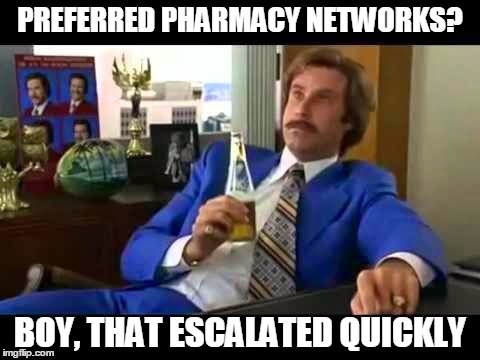 For a summary of pharmacy chains’ participation in preferred networks, see Walmart and Walgreens Dominate 2015 Part D Preferred Networks, With Independents Close Behind. UnitedHealthcare remains the enrollment leader. UnitedHealthcare offers two AARP plans with preferred cost sharing pharmacy networks. These plans have 4.9 million (25.8%) of enrollees. Humana remains the growth leader. Humana has three preferred network plans: Humana Enhanced, Humana Preferred Rx Plan (its original plan with Walmart), and the co-branded Humana Walmart Rx Plan. These three plans collectively have 4.1 million (21.7%) of total Part D enrollees. That’s 19% higher than Humana’s 3.5 million total from last January. Other major preferred plans did well. All three Cigna-HealthSpring plans (Rx Secure, Rx Secure-Xtra, and Rx Secure-Max) have preferred cost sharing networks. Enrollment is 1.4 million, or 7.3% of the total. Wellcare, the fifth-largest parent organization, has three preferred network plans, with 1.1 million enrollees (6.0%). Aetna has stirred up trouble. Aetna’s two plans, both of which have preferred cost sharing, enrolled 692,000 seniors (3.6%). 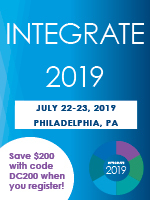 The Aetna Medicare Rx Saver PDP has preferred cost-sharing in only 29 regions, and no preferred cost sharing in 5 regions. The Aetna Medicare Rx Premier PDP has preferred cost sharing in all 34 regions. However, Aetna’s 2015 plans have been controversial, because of allegations that its online plan information did not accurately identify preferred pharmacies. See the Chicago Tribune's Aetna mistake could complicate some Part D drug refills. Is Rite Aid laughing like a ventriloquist’s dummy? 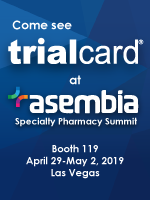 Symphonix has two co-branded preferred cost sharing plans: Symphonix Rite Aid Premier Rx and Symphonix Rite Aid Value Rx. Both plans are offered in 18 regions. In 12 other regions without a Rite Aid pharmacy, two plans—Symphonix Premier Rx and Symphonix Value Rx—have preferred cost-sharing. The Symphonix plans enrolled 143,400 people, or just 0.8% of the January total. Given the negative impact of Part D plans on pharmacy margins, Rite Aid may be an unexpected winner. In 2014, CMS proposed major changes to Part D’s pharmacy regulations that would have eliminated many preferred network benefits. After many outside stakeholders sharply criticized the changes, CMS withdrew many of the proposed regulations. The popularity and success of preferred networks in Medicare Part D suggests that they will remain a significant part of the program. Data covering the entire open enrollment period will be released in February. Until then, you stay classy, Drug Channels. CORRECTION: In the original version of today's article, there is a small error. We miscalculated CVS Health's SilverScript enrollment for January 2014, erroneously concluding that its open network plan had lost members. In reality, its preferred network plan lost members, while its open network plan gained members. We have corrected the text, and apologize for the error. I don't see any mention of Anthem's PDP offering. Were they excluded because they don't offer a standalone PDP plan or because they don't have a narrow network option for PDP? According to the CMS data, Anthem's Blue MedicareRx plans enrolled 427K people, or 2.2% of total enrollment. Of these people, 95% are in plans with preferred networks. The various state BCBS plans are not included in those figures.